The Guardian isn't exactly known for its objectivity or the quality of its editorials but their latest UKIP editorial is particularly dire. The Guardian have a bee in their bonnet about Rupert Murdoch having dinner with Nigel Farage last month. You see, while it is perfectly acceptable for the Guardian's editor to meet politicians or have secret meetings with the Met Police Commissioner, it is entirely unacceptable for Murdoch to meet anyone the Guardian disapproves of. Or to consume oxygen. The hacks at the Guardian disapprove of the Sun's recognition of UKIP as a serious political force and part of mainstream politics. It doesn't matter that UKIP is consistently polling as much as double the Lib Dems, consistently beating one or two of the LibLabCon parties in every Westminster by-election and winning council by-elections; as far as the Guardian is concerned UKIP are a fringe party that should be mocked for thinking it's one of the big boys. The effect of these headlines and stories is to bring Ukip from the fringe into the mainstream, to legitimise it as a serious political contender. The Sun is urging its readers not to see it as a marginal party that the prime minister, David Cameron, once ridiculed as full of "fruitcakes, loonies and closet racists". UKIP has brought itself from the fringe in the mainstream and legitimised itself as a serious political contender by performing so well in elections and showing that a UKIP vote can be a winning vote. The Guardian clearly thinks that the dead tree press is more important that it is. Getting the Sun's backing would of course be very welcome but it would happen because UKIP was already credible and electable. Murdoch clearly agreed, giving a giant clue to his sympathies on Twitter with a tweet saying "Farage reflecting opinion". In other words, reflecting Murdoch's, and the Sun's, opinion. UKIP didn't come second in Eastleigh because the party reflects Rupert Murdoch or the Sun's opinion, UKIP came second because it reflects the opinions of a huge proportion of the population. Ukip exists for one reason: to remove Britain from the European Union. 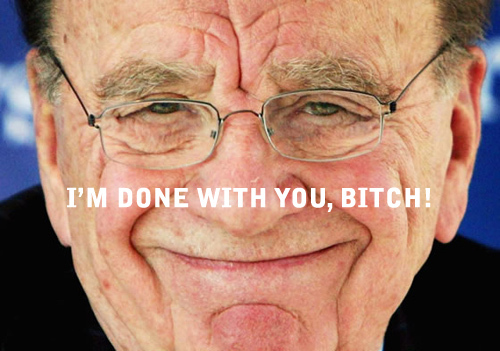 And that has long been Murdoch's desire too. UKIP has the largest and most comprehensive manifesto of any mainstream party. The party was founded as an anti-EU campaign but has evolved over the years into a credible party with a mature and comprehensive set of policies. It hasn't been just about the EU for years, it's time the Guardian caught up with reality. That apart, Farage must also realise that there is another maverick contender for Murdoch's hand: Boris Johnson. If Johnson were leader, the Sun's master would surely get right behind him. Then again, perhaps Farage would do the same. Like all formerly-eurosceptic senior Tories, Boris realised that he wasn't going to get anywhere in his party unless he abandoned his principals and started promoting our EU membership to the plebs. So he abandoned his principals. Is it any wonder the hypocritical, lazy, tax dodging Guardian is losing money?